That's what we have here, the rain really came down at 4AM, but abated somewhat and I went to work at my normal time. Update: It's 2:00 PM and it's absolutely beautiful outside, sunny and dry, about 60 degrees. Amazing! This is why I have trouble believing the weather mavens. According to their projections, Wilma will move approximately 100 miles between Saturday morning and Sunday morning, for an average speed of about 4 miles per hour. Then, it'll move about 250 miles between then and Monday morning, apparently speeding up to an average of 10 MPH. Finally, by Tuesday morning, it'll have be moving at an average of 30 MPH to end up 750 miles out to sea! Now, that's some pretty strong westerly winds. It seems to me that if the winds are that strong, it'd tear that storm apart pretty darn quick. This morning, I caught about 2 minutes of Fox 'n Friends. They had a "weather expert" on talking about Wilma, and he said that the models they have make contradictory predictions, because the U-turn they expect plays hobb with their numbers. The Foxbabe then said (paraphrasing closely), "Yes, we keep getting different reports. 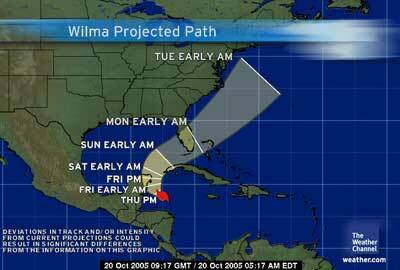 Ted, exactly what day will Wilma make landfall? And at what time?" Update: My co-worker tells me I'm an idiot (not unlikely), and that storms routinely get up to 30 MPH speeds after they've made landfall. I'm still skeptical. Can anyone with the time please look this up? Update 2: OK, I heard a weatherman on the Weather Channel say that it's expected that Wilma will be moving at 25 miles-per-houer as she barrels over Florida. I stand corrected. Well, as usual, we're keeping a weather eye on Wilma, and it looks pretty certain that we're going to have to deal with her this weekend. Over and above the normal anxiety of a hurricane, we're having our annual Halloween party Saturday night. As of this moment, we haven't made a decision whether or not to cancel it.